The Big Apple is one of my favorite places to visit because there are so many things to do in New York City. I absolutely love the energy of the city, where someone is always out and on the go! 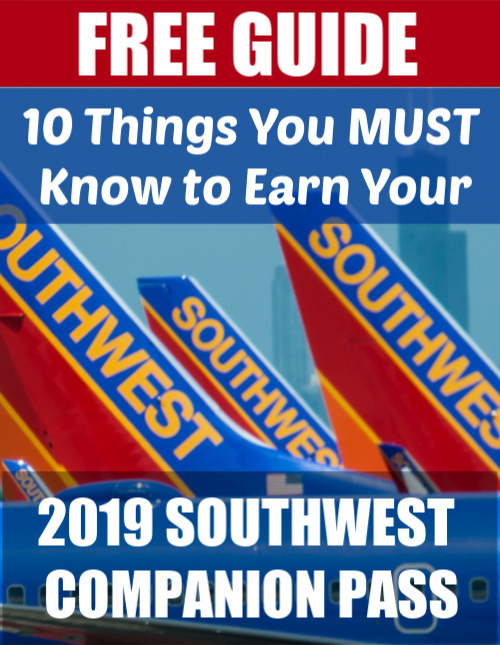 New York City is a super cheap flight from our home city of Indianapolis on Southwest to Newark Airport, but because I always like to pay in points and not cash, we booked this trip for 7,700 Southwest points per person. Because we always hold the Southwest Companion Pass, which lets one of my family members fly free with me (aside from the mandatory $5.60 government security fee per way), we only paid for three passengers, totaling only ~23,000 points. I’ve seen prices as low as 6,000 point per person round-trip to NYC, so, for us, it’s a great trip that costs relatively few miles. Note: This post contains affiliate links for which Go to Travel Gal may earn a commission to support the blog if you book through them. 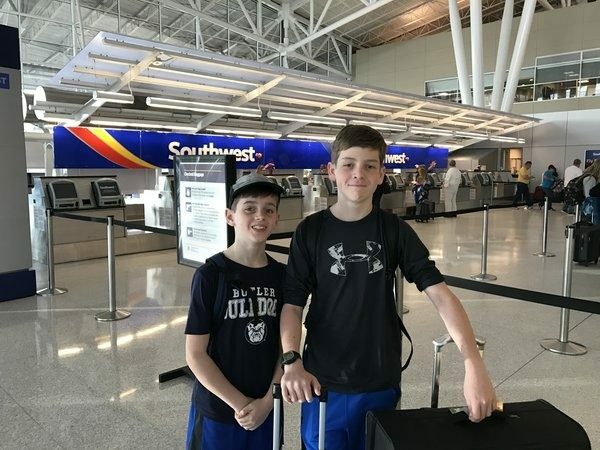 We took our kids for the first time when they were ages 8 and 12 and gave them an introduction to all that is the Big Apple. This is not a city where kids will get bored, because there is no shortage of things to do in New York City! In fact, your bigger problem will be that they will complain about how their feet are so tired! I have taken the NBC Studio Tour a couple times over the years and always enjoyed it. While the tour itself isn’t new, they have added some new components over the years. 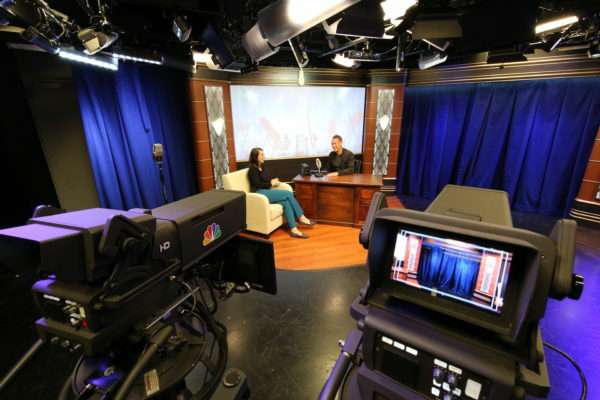 As always, you get a behind-the-scenes look at NBC’s New York studios, including the Saturday Night Live set, The Today Show, The Tonight Show and NBC News. Note: You’ll get to see two of these on your tour, not all four. It’s always fun to see these sets in real life and you never know what celebrity might walk by as you tour the halls. Cheryl Tiegs walked by while we were on the tour. In addition to seeing the studios and learning some NBC history, you also get to make your own talk show. Everyone in your tour group gets a role from host and announcer to the band and camera operator. Watch the “talk show” we made with our group in this fun video below (my cameo is at the very end and my then 8-year-old is on guitar in the “band”). The New York Pass is a fantastic pass that gets you entry into more than 80 New York City attractions. You can buy a pass that is good for between one and 10 days, depending on the length of your visit or the amount of sight-seeing you plan to do. Included in your pass is a ticket for Big Bus Tours as one of the accessible attractions. 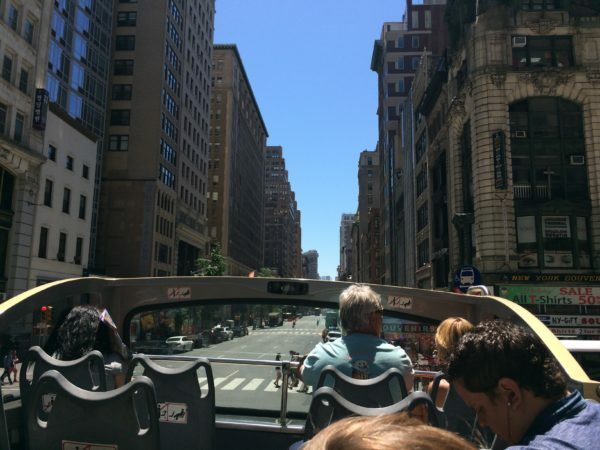 While I was hesitant to hop on any sort of bus tour, we decided to try it out, as it also serves as transportation around the city. With the New York Pass, you can hop on and hop off at stops all across Manhattan and even into Brooklyn, which is very handy. While we rode the bus for the transportation, we found we really enjoyed the tour itself. The buses are double-deckers, like you see in London, with outdoor seating on the top. Viewing the city from these top seats was really amazing. If you enjoy architecture, these seats really give you a different perspective of the buildings unlike trying to strain your neck and look up from the ground. Seeing New York City by water is a must-do! The city is jaw-dropping from this vantage point, and I love the presence of the new One World Trade Center in the skyline. Spirit of New York offers lunch and dinner cruises that sail around the city, past the Brooklyn Bridge and REALLY close to the Statue of Liberty (much better than the Staten Island Ferry). Choose from dinner and brunch cruises where you can enjoy live music, seasonal cocktails and freshly-prepared cuisine. 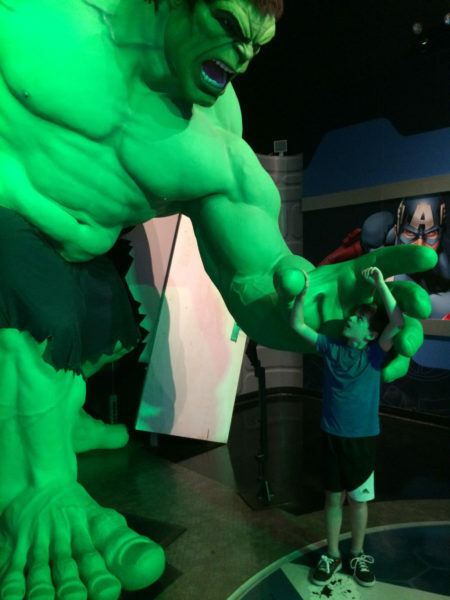 This Times Square-area attraction is super fun for kids to get up close to their favorite celebrities and sports stars. It’s so interesting to see what it would be like to walk up to famous people from historic figures to Pope Francis to Kim Kardashian. I always enjoy seeing their height and physical dimensions, as it gives you an idea of what it would be like to see them in real life. The museum also has a special Ghostbusters exhibit, where you venture into the New York City underground subway tracks, see the basement of a haunted mansion and visit Ghostbusters headquarters. There’s also a “sensory” experience where you don glasses and grab pretend guns, and through virtual reality and interactive effects on a physical set, become a real ghostbuster. While this is best done during warmer months, you could certainly venture out on a mild winter day. This is my favorite FREE thing to do in the city! 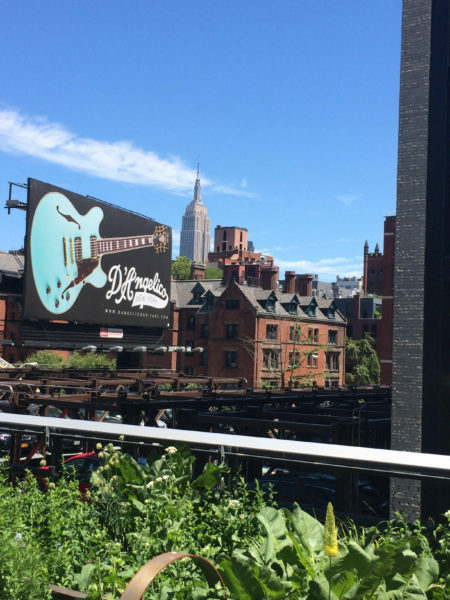 The High Line in New York City’s Chelsea is a city park made from former railroad tracks. 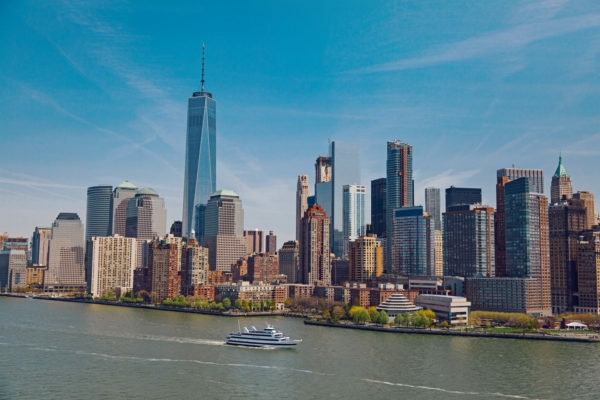 It gives you an elevated view of the city, fantastic Empire State Building views, incredible architecture of the many buildings you’ll see along the way and outstanding people watching! They are continuing to build interesting new structures in and around this area, so it’s continually growing and changing. If you enjoy the outdoors in the city, check out these rooftop bars in NYC. Because your kids WILL complain that their feet are tired—and the adults will probably feel the same way—making time for breaks is a GOOD idea. After walking around Greenwich Village one afternoon, we arrived at Washington Square Park and decided to park it on a bench for a bit. To my surprise, my kids, a bit old for a playground, had a ball blowing off some steam and running around the play area with the other kids. Plus, if it gets too hot, you can splash a bit in the fountain for even more fun. Another great spot to relax for a bit is Central Park. To get there take the subway or hail a taxi. If hailing a taxi makes you nervous, don’t miss my tips for How to Hail a Taxi in New York City. You can rent bikes from Central Park Sightseeing or choose bike rentals as an option with your New York Pass to get a broader view of the park. Or, you could simply pack a picnic and hang out while people-watching. The New York Hilton Midtown put together a complimentary picnic basket for our family from their grab and go-style Herb ‘N Kitchen market. 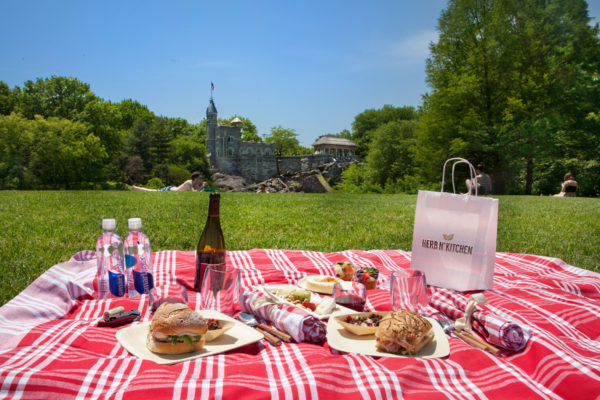 Normally available for $68 for two, it includes Murray’s Cheese, two sandwiches, two signature salads, New York cheesecake and a bottle of sustainable wine along with a blanket, plates, and glasses. It was great to have everything ready to go and spread out in the sun while the kids ran around on the Central Park rocks :). We also got all four of us second row seats to see “School of Rock” on Broadway for less than $200 using Starwood Preferred Guest points. Here’s how to did it with points from just one credit card sign-up. One of my favorite hotels EVER, not just in NYC, is EVEN Hotels, a wellness-themed brand that helps you stay on track with your health when traveling. 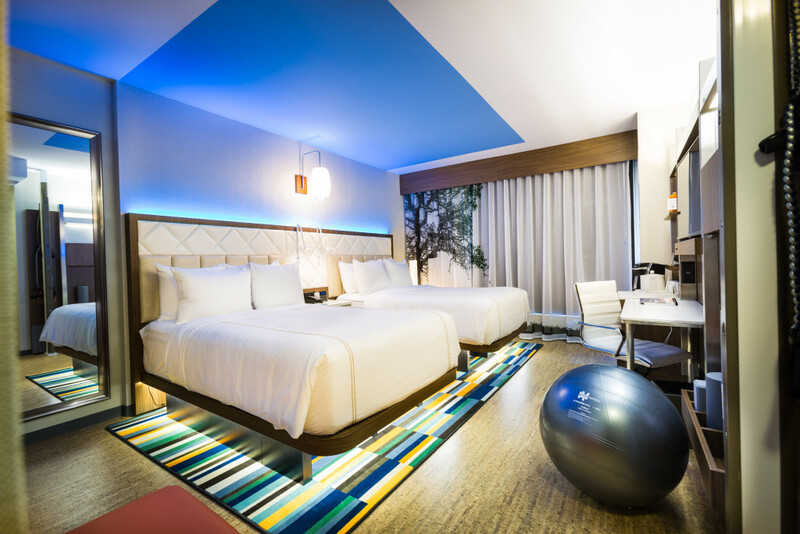 They truly have wellness incorporated into every detail of this hotel from the yoga mat and exercise bands in the room to the healthy options in their restaurant to the state-of-the-art fitness room, ergonomic chairs and stand-up desk. Read my full review of the property here. There is an EVEN just south of Times Square close to Madison Square Garden, a great location that is close enough to Times Square (about a 15-minute walk) yet out of the center of craziness. You are also close to the High Line and can walk south down into Chelsea or nearby Hell’s Kitchen in just a few minutes. There is also a property in Midtown East, another great location about a 15-minute walk east of Times Square that is much quieter and close to Central Park and Grand Central Station, perfect for getting anywhere in the city. Want more hotel recommendations? Kidventurous has a list of family-friendly New York City hotels.